My husband just arrived from his trip to Davao and he brought home this Digong’s Spanish Style Sardines. I don’t know how the name of this sardines originated but I think it’s pretty obvious. It was named after President Rodrigo Duterte. I googled about this product and found out on their Facebook page that this was bottled during the 2016 election in support for Mayor Rodrigo Duterte’s (now the Philippine President) candidacy. 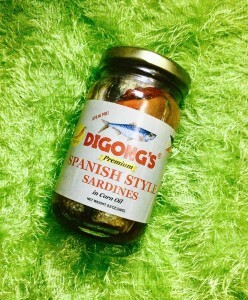 I like the taste of this Spanish sardines and I love it because it is spicy. If ever my husband will have the opportunity to go back to Davao, I will definitely ask him to buy this again for me. This is also one good way of supporting our local brands.